Huffy and Mongoose remain two prominent bike manufacturers that produce a variety of bikes for all types of terrain, including BMX, cruiser, urban and mountain bikes. While both brands share certain similarities, their mountain bikes have key differences in styling, function and prices. Huffy attracts a more traditional bike enthusiast with its more conservative styles. Mongoose has focused on a more aggressive style of riding since its founding, when it only made BMX bikes. Huffy was founded in 1892 by George P. Huffman in Dayton, Ohio. In business for over 100 years, Huffy bicycles have evolved from the first bike manufactured at the Davis Sewing Machine Company to the modern engineered mountain bikes now produced in its factories. Huffy released its first mountain bike, called the Huffy Blades, in 1996. Meanwhile, Mongoose is a young company, established in Southern California in 1974. The Tomac Signature, Mongoose's first model of mountain bike, was released in 1987. Huffy produces bikes for general mountain-bike riding. Mongoose however, takes a more detailed approach by creating bikes that meet the specifications of the different types of mountain-bike riding. 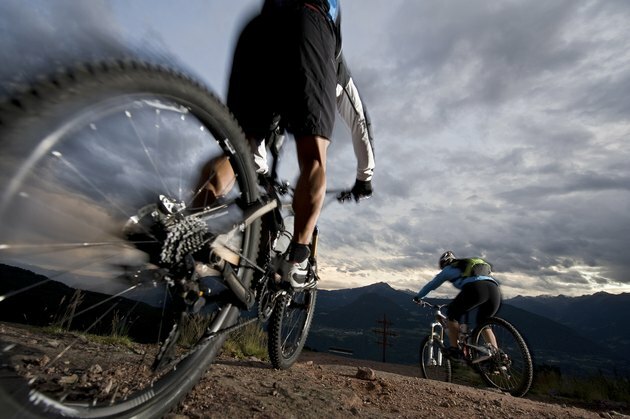 Mongoose has all-purpose mountain bike models, which can be used for all types of mountain-bike riding. Mongoose offers a special model of mountain bike for commuters. According to Mongoose, these bikes are made for riders who typically ride their bikes on a paved surface but enjoy the feel of a mountain bike. Mongoose also has specialty models built specifically for downhill mountain-biking trails. Mongoose also offers mountain bikes with lightweight frames used for dirt jumping. Mountain bikes from Huffy and Mongoose feature a handbrake system that enables the rider to quickly decrease his momentum to avoid any hazards on the mountain-biking terrain. Due to the uneven surface that remains common on mountain-biking trails, Huffy and Mongoose models feature shock-absorbent suspensions. Many of the mountain-bike models from Huffy feature a front-fork suspension. This means that the bikes' shocks are located on the front fork, which holds the front wheel in place. The suspension in the top-of-the-line Mongoose models is located near the middle of the bike frame. The mountain bikes from Mongoose have a standard-sized tire, with a diameter of 26 inches. Huffy offers options for mountain-bike riders who might have a shorter stature. According to Huffy, as well as having mountain bikes that feature the standard 26-inch tire, the company also offers a shorter model of mountain bike whose tires measure 24 inches in diameter. Huffy mountain bikes are built for the more casual mountain-bike rider. As of 2013, the top-of-the-line Huffy mountain bike costs around $475. The top-of-the-line Mongoose models are constructed with avid and professional mountain bikers in mind. As of 2013, these hybrid mountain bikes from Mongoose, which feature new and innovative bike frame designs, can cost up to $4,000.